PERFECT ADHERENCE WOOD RIM-TUBULAR sealing between the wood rim and the tubular is better and more homogeneous. The wood is a poor conductor of heat. In descents roads requiring prolonged use of the brakes, the braking friction generates a huge amount of heat. In wood rims, differently from metal ones, heating is not transmitted by conduction to the paste sealing the tubular to the rim. The maximum tubular hold contact surface is always guaranteed under any possible condition. HIGH QUALITY BRAKING the friction between wood rim and pads is higher and the effectiveness of braking is improved. RESTORATION the wooden rims Hickory are ideal for restoration of vintage race bikes from end of 30′ ies until beginning of 90′ ies. The experience of those who practice cycling, shows that impacts, expecially if unexpected, overstress wrists, elbows, shoulders and spine. 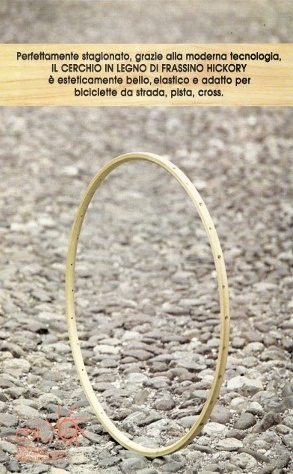 The characteristics of this CB Italia wooden rims limit the transmission of impacts and reduce detrimental action significantly .